Dive two of Cozumel’s world class coral reefs on a 5-hour diving trip from Playa del Carmen for certified divers. 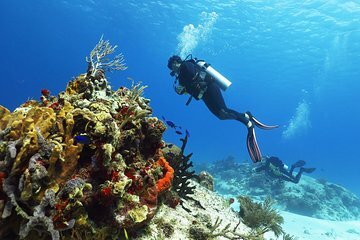 This small-group diving tour is limited to 10 people for individualized attention from the guide, and includes the Cozumel Reefs National Marine Park fee, use of weights, and dives at two sites. Due to the depth and currents at Colombia Reef, this trip is best suited to experienced divers, and additional dive equipment is available to rent. Make your way to a dive center in Playa del Carmen for 8:15am departure, then board a boat from Playa del Carmen to Cozumel, a 45-minute trip. The first dive site of the day is at Palancar Reef, where your dive gear will be set up and waiting: this experience includes weights and two tanks, and remaining dive equipment is available to rent for USD $15. This site has a fascinating landscape of corals and sponges growing on a wall, and you can expect to see giant moray eels, turtles, crabs, groupers, and lobster. Because the Palancar Reef is adjacent to deeper waters, watch for the occasional large pelagic fish or shark. Refuel with snacks and drinks on board the boat as you make your way to the second dive site, at the Columbia Reef. A relatively shallow reef and great visibility means the bright coral and reef fishes are especially vibrant here, and you may catch a glimpse of a harmless nurse shark. Look beneath shallow reef outcroppings to find the splendid toadfish, which is endemic to the island of Cozumel, and can’t be found anywhere else in the world. After your second dive, make your way back to Playa del Carmen, where this tour concludes at roughly 1:30pm.